Crewe News: Get ready to rock! 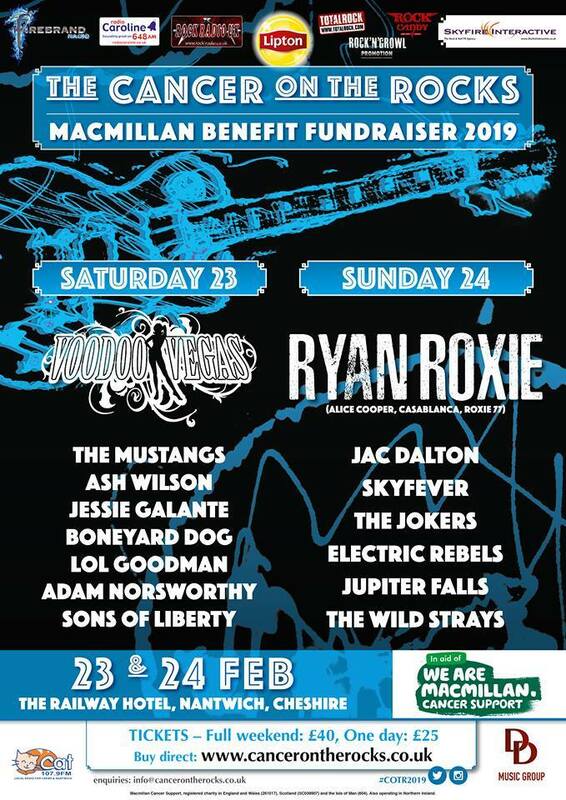 The 2nd annual ‘Cancer On The Rocks’ rock and blues music festival takes place in a heated marquee at the rear of The Railway Hotel on Pillory Street in Nantwich on the weekend of Saturday 23rd and Sunday 24th February 2019. All profits from the weekend will go to Macmillan Cancer Support. Music on Saturday 23rd is from Sons of Liberty, Adam Norsworthy, Lol Goodwin, Boneyard Dog, Jessie Galante, Ash Wilson, The Mustangs, and Voodoo Vegas. Music on Sunday 24th is from The Wild Strays, Jupiter Falls, Electric Rebels, The Jokers, Skyfever, Jac Dalton, and Ryan Roxie. There is also a prize raffle with a chance to win a hand built custom acoustic/electric Hybrid guitar from Australian manufacturers Fican, valued at just under £2,000. The inaugural Cancer On The Rocks festival last year raised £2,500 for Macmillan Cancer Support, so it its hoped this year’s event will beat that total.